The quilts are due at the night meeting in September. This year’s challenge is to use a triadic color scheme in your project. Choose 3 colors that are equally spaced on the color wheel. You may use tints or shades of these 3 colors. In order to complete your design, you may use any neutrals such as white, beige, gray	or black. Find a color wheel to look at. Did you make one in Rachel’s class? Do you have a quilt book that has a wheel? Do you have a tablet or computer where you can Google “Color Wheel”.? Look at a color wheel and find 3 colors that are equally spaced around the wheel such as: green, purple and orange. If you choose this triad of colors you can use any shades or tints of green, purple and orange in your quilt. Next you can add any neutrals to your quilt. For fun but no required: Download this free or cheap APP on your phone or tablet, Color WheelBasic color schemes in the app, click on the icon “wheel” in the lower left to change the wheel from basic to tints or shades of colors. Next click on the 2nd icon from the left at the bottom. This icon will show you all of the triadic color choices. Your fabric choices do not have to be solids. Try using this challenge as a stash buster! Challenge Quilts 2015. 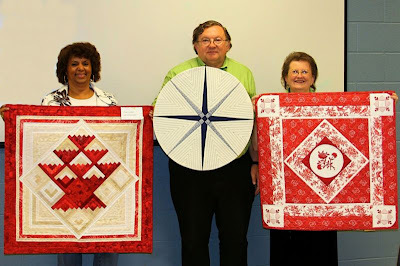 This marks the Silver Jubilee of the Cherokee Rose Quilt Guild. Those wishing to participate in the 2012 Challenge Quilt should select a sealed bag from Beverly. Her theme for the Challenge is that ART can be found everywhere in our lives and we should look at ordinary items as meaningful creations of line, shape, color and function. The secret artistic household item in the bag is to be the inspiration for your color or design or fabric memory when constructing the challenge quilt. Instructions are included in the bag. The day people will be given a chance to pick up their bags at the next meeting. For questions call Bev Mahle. The quilts are due at the night meeting in September. Challenge Quilts 2011 Two Color Quilt Challenge. Must use Red/White or Navy/Off White for colors. Must be not less than 12" square and not more than 36" square. Can be 144" total perimeter if you want to make it rectangular or round. Not less than 48" total perimeter. Must have a nine-patch block somewhere on quilt. Remember there are many different kinds of 9-patches, such as shoo-fly, monkey wrench, etc. Also many 9-patches together form a checkerboard. The entire quilt could be a 9-patch. Challenge Quilts 2010 In an effort to improve participation in the quilt challenge this year, we are attempting to Make it Simple. Rule #1: You will draw a fat quarter at a Guild meeting. Then you will be required to make a quilt (any size), drawing inspiration from the fabric. The quilt must be three layers, quilted and finished. You must use the fat quarter in the quilt. You can use all of it or just a portion. Don't forget to see Patti to draw your fat quarter! Rule #2: Have Fun!!! An award will be given to the person with the quilt voted as the best by the membership.